I supposed I have been writing fairly consistently online now for over 18 months. This involves my own personal blog, but also doing freelance work for a number of businesses such as Kidspot, Babyology and Upworthy. All of the work I have done for these companies have been paid commissions. My time and effort for their business was rewarded with a deposit of mutually agreed upon money into my bank account. This seems like an obvious type of transaction, pretty straight forward really. Well, you would think. In my time as a freelancer however, I have come across numerous businesses and companies who advertise needing content for their websites, but when contacted they state they only pay via “exposure”. i.e. They provide links to my website and give me credit, but they don’t actually pay me any money for my work. Work that I have put effort in, set time aside in my busy schedule to complete. Good work, that is well thought out and worthy of payment. But according to these companies – my time and effort is not valuable enough as a professional to be paid actual money – only by exposure to their website. 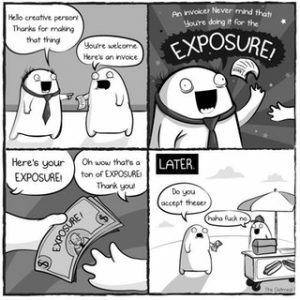 Fabulous comic courtesy of The Oatmeal. And you know what? It simply isn’t good enough. Because my time and effort is valuable, and the time I spend dedicating myself to fulfilling my end of the agreement is worthy of monetary payment. Exposure bucks do not pay my rent, and nor do they really benefit me at all in the grand scheme of things. Companies who use freelance journalists and writers this way are taking advantage of them, and are basically telling them that their expertise and dedication is worthless. Because of this, I made a decision a while ago now that I would no longer be taking on any “exposure only” work, for the sake of my personal integrity as a writer and journalist. I know I am worthy of being paid for my time and effort, and I refuse to settle for less than what is now my established fee – and I’d strongly encourage others like me, to do the same. Do not settle. You are worthy. « Reuters » What freelancing really looks like.